creative/exciting/funny/scary/beautiful entries in a variety of mediums. special Fan Art Gallery on our website! Gloomth award rosette and $150 gift certificate to the web catalogue! certificate to the web catalogue! think of- it just has to have an item from our catalogue shown in it). 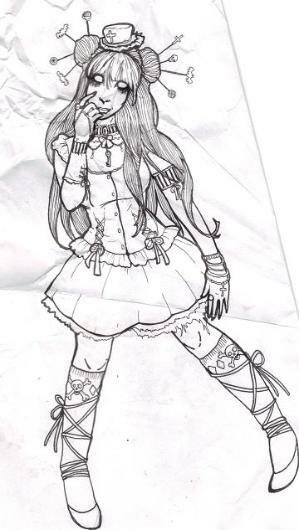 Here’s an example of a drawing Taeden did of some random girl wearing our Blackcherry top and Sable skirt! This would be an acceptable entry, but Tae can’t enter the contest and this piece is therefore disqualified. one gift certificate if you win so be prepared to share! **Please no stories/poems/written submissions. This is a visual art contest. TO SEE THE FAN ART CONTEST ALBUM CLICK HERE! you send it the more chance you have of people voting for it. your piece the more likely it is that you’ll win! November 5th on the Gloomthzine/Facebook. I am seriously impressed with the turn-out. Woowoo! Me too! It’s really heartwarming to see all the entries and they’re all so damn good!!!! We have some super talented fans! ← Gloomth in the News!